"Almost all human endeavour is ephemeral, all that is left in the end is love and friendship." So said Errol Morris at the screening of his latest movie, The B-Side, in which he spends a little over an hour on-screen with his friend and family portrait photographer Elsa Dorfman. Now 78 and in retirement, she is known primarily for working with a rare, large-format Polaroid instant camera, 20" x 24", of which there are only six in existence, one of them owned by her for decades. 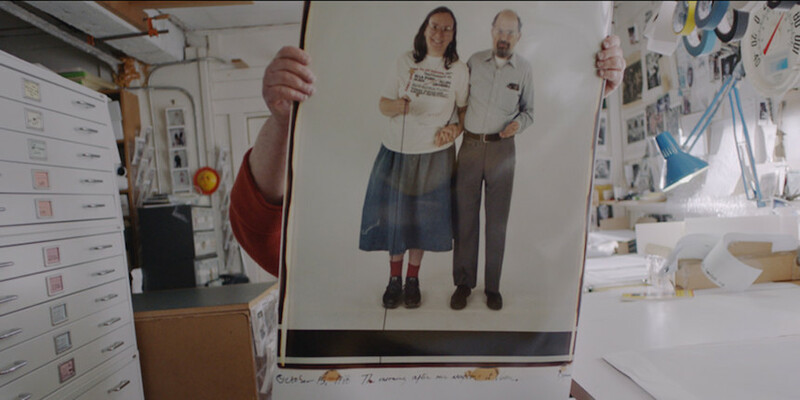 And while she has photographed many famous people, from Bob Dylan, Janis Joplin, and Faye Dunaway to her close friend, beat poet and conscientious objector Allan Ginsberg (who features largely here in life and death), it is her career as an everyday portrait photographer that Morris is most keen on exploring here. A self-proclaimed nice little Jewish girl from Massachusetts, Dorfman has a sunny outlook and a warm personality that makes the short time we get to spend with her leafing through her flat-filing cabinets of prints over the decades, an absolute pleasure. Using a multi-camera set-up (no Interrotron here), this is Morris at his most loose and relaxed, but his subject and approach is in no way lacking in rigour and revelation. The director has a long history of thinking about the nature of photography, from his 25,000 word essay on two photos from a canon-ball strewn road taken during the nineteenth century Crimean War, to his documentary feature on the famous torture photos taken by military personnel at the famous Abu Graib Prison, Standard Operating Procedure. When Dorfman scoffs at the 'camera capturing the soul' in her work, there is a kindred spirit at play. Photography "is not real at all," she says. It is just a moment that happened, where the complex development process captured and displayed it moments later. Due to the expensive nature of large Polaroid film, when she does her portraits she takes two pictures of the family and lets them choose the one they want. Since there are no negatives, she cannot keep that one, but instead is left with the 'b-side,' the one the family left behind. In her way, she feels that the b-side, the so-called 'mistake,' is the better one, and can be quite different form the other photo, capturing a totally different 'narrative' even though they were taken moments apart. For a photographer and artist to be left with only the left-overs is an interesting concept in itself. The B-Side is Elsa, in her own charming accent, telling us who she is and where she came from, while talking about her family and how she feels about her work and career. It does so in her studio, occasionally with one of Morris' cameras peaking at her eyes from inside the cabinet as she pulls out another oversized print. The photographs unearthed from these drawers do as much of the talking as Dorfman does, in the way photographs do. At 79, Dorfman is (more or less) retired. For that matter, the entire Polaroid corporation, which stopped making the film she uses in 2008, is kind of retired too. In considering what to do with her extensive archive, she reflects, with no false modesty, that portrait photography becomes truly relevant when the subjects pass on. Not in a sad way, but rather a reminder of time, memory and all of the love and friendship accumulated over a lifetime.